On my 46th birthday (July 16), I was reduced to my 10-year-old self. I laughed, jumped for joy, squeed more than a few times, and quite literally performed at least one happy dance. My eyes were a little brighter, and my steps a little lighter. All because of Star Wars. And that’s a good thing…a VERY good thing! When it comes to Star Wars, I’m a big kid at heart anyway, as I’m most (or all) of you reading this right now can relate. Overall, it’s a great time to be a Star Wars fan, but with all of the news that came out of Star Wars Celebration Europe (SWCE) over the last few days, my kid-o-meter has flown off the charts! …and it all happened on or within a day of my birthday! There is SO much to dissect, and I cannot possibly do every morsel here, but this is a recap of some of MY favorite announcements, moments, and happenings. I am not going to discuss the Rebels Panel or highlights therein, because there will be a Special Edition of Rebels Reactions to post soon! I will once again be joining Aaron Harris, as well as fellow bloggers Mike MacDonald, Becca Benjamin and Craig Dickinson for a roundtable discussion. Keep checking for updates! Watching the live stream through starwars.com was amazing! Gwendoline Christie looked absolutely stunning, and she’s quite a gifted host! Not only did she succeed in making segue after smooth segue during the panel (even during “touchy” moments *ahem*), but she was full of wit, humor, and class. Her invitation for a moment of silence for the Nice incident in France was respectful, yet didn’t detract from the purpose of the panel overall. I adored her even more for the geeky selfie she insisted on taking onstage, and later posted to Twitter! Gareth Edwards has more of my respect after that panel. I did not really know much about him, his work, or his overall intentions for Rogue One, and that did concern me a little. As it turns out, he seems to be spot-on with his philosophy and intentions for the story and what it brings to the Star Wars Sabacc table as a whole. I love that he is an intense fan himself, and that he holds a reverence for the saga that allows him to walk that fine line between respecting its traditions, yet being innovative. The cast and crew were spectacular. There was an energy onstage that was palpable. It is obvious that the actors who are involved with Rogue One have enthusiasm and pride in what they will ultimately be bringing to the fans. I couldn’t help but giggle every time one of the cast members stopped and looked to Kathleen Kennedy for confirmation that they were allowed to reveal certain pieces of information! 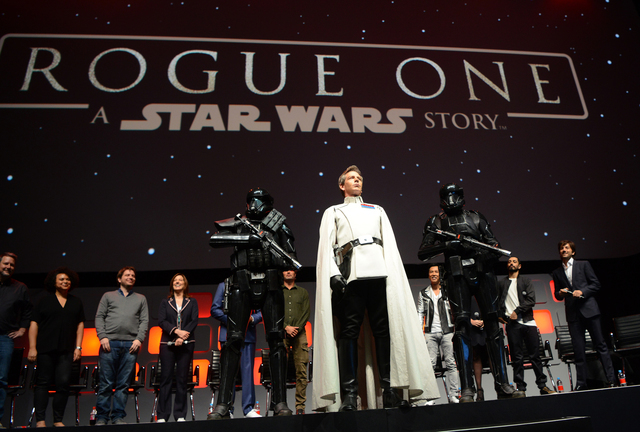 Of course, Ben Mendelsohn owning the entire venue in full costume as Imperial Director Orson Krennic was theatrically insane! His banter with Ms. Christie onstage was simply adorable, as well. Felicity Jones being presented with her Jyn Erso action figure by Captain Phasma was priceless! I truly believe that the marketing powers-that-be will learn from the past, and will make Jyn Erso – as well as other female characters – readily available for fans to locate and add to their collections. I have faith that we will not be seeing a #WheresJyn trend in social media! K-2SO promises to be quite the character! I loved the way Tudyk also recalled his interaction with Anthony Daniels (C-3PO), in that Daniels was somewhat salty (in a good-natured way) about the fact that Tudyk’s droid character didn’t have to wear a suit, but is CG. They exchanged quite a humorous little ditty! Forest Whitaker. Saw Gerrera. What more is there to say? Clone Wars fans, like myself, were thrilled to see this bridge from small screen to big, and that our cherished series would continue to live on in this way. I’m so excited to see how these threads will ultimately be woven! The Sizzle Reel itself gave me chills. The sights, sounds and behind-the-scenes glimpses are heart-stopping. Yes, it was somewhat disappointing not to get a new trailer, but this was perfect for me! …and that poster… *sigh*. Breathtaking. I’m so psyched that we are recognizing yet more planets in our Galaxy Far, Far Away, and seeing more varied environments in Star Wars overall. Scarif is a stunningly beautiful tropical/beach planet. Who doesn’t love the beach?! It was really awesome that everyone in attendance got one of those posters! I was also more than delighted to see the announcement that Scarif will be added as one of the playable environments for EA/DICE ‘s final Star Wars: Battlefront expansion pack, due out this holiday season. Season Pass holders will be able to get their hands on it two weeks earlier than the general release. Yay! I don’t actually play (I’m XBCC – Xbox Controller Challenged), but I love to watch my son play! Jedha has me intrigued. It was explained as a “spiritual planet,” one to which people travel as sort of pilgrimage, in a time when The Force is still held by some as a belief system. It will also play a crucial role in the story overall. One of the things that both excite and overwhelm me is the amazing supplementation print media has brought to the overall Star Wars universe. People: if you haven’t invested in these, you’re really missing out. That being said, however, there are aspects of Star Wars fandom (like print media) that are just not for everyone, and that doesn’t make you any less of a fan, trust me! While it can be a daunting task to ingest everything out there (I just made a timeline/schedule for myself in order to keep track of everything), if you are the least bit inclined toward this aspect of fandom, you do owe it to yourself to at least try. The comics are insightful and SO well-done, and the plethora of existing/upcoming books is crazy-exciting! If you are on a budget, there may be a local book-sharing group near you, and there’s always the local library. I’m a huge advocate for libraries in general, and without community support, these entities could cease to exist! Audio books are great for on-the-go listening. There are many ways to get your ears on an audio book. I sometimes switch back and forth between audio and print on the same publication, just to be able to devour it! So, I’m stepping off my soap-box now. Here’s the rundown of three of the upcoming major novels recently announced. Keep in mind that these are only a sampling of what’s to come – there are more tie-in mini-novels, as well as short stories slated to appear, including upcoming issues of Star Wars Insider magazine. Look for upcoming titles from DK, Del Rey, and Disney Publishing, as well as specific works from author Jason Fry. There’s also a new galactic atlas to be released, featuring 600-700 illustrations. The idea behind this atlas is that the illustrations were supposedly drawn by an Ithorian artist and have just been discovered and catalogued. How cool is that?! A two-volume Ralph McQuarrie concept art set is also slated for release. Ahsoka, E.K. Johnston. Release date: October 11, 2016. Although we’ve known about the novel for a while, the cover art was revealed at SWCE by none other than Dave Filoni! As a huge Ahsoka fan, I am insanely excited for this one. #AhsokaLives! Catalyst: A Rogue One Novel, James Luceno. Release date: November 16, 2016. This novel will serve as a prequel to the movie, and for Luceno fans, this announcement is an exciting one, indeed! Thrawn, Timothy Zahn. Release date: sometime in 2017. The announcement that Grand Admiral Thrawn is now canon has answered many heartfelt appeals of the fans of this character (including myself)! Not only will we have this novel, Thrawn will also be featured in Star Wars Rebels. If you aren’t familiar with Chiss Admiral Mitth’raw’nuruodo, you owe it to yourself to brush up on your character history by reading “The Thrawn Trilogy,” also by Timothy Zahn (Heir to the Empire, The Last Command, Dark Force Rising). Don’t worry, you have plenty of time before Season 3 of Star Wars Rebels! I just purchased my own copy of these books (happy birthday to me), so I can re-read them myself. I had only ever borrowed them from my local library, but I felt it was time to add these to my personal library! The hardcover Barnes and Noble exclusive edition of Chuck Wendig’s Life Debt, which includes a pull-out poster of Mr. Bones (LOVE him), and Millennium Falcon cross-sections. I already started listening to the audiobook (which is very well-narrated by Marc Thompson), but wanted that hardcover for my collection. My shipment of the two Redbubble graphic t-shirt dresses I ordered (which I will be reviewing in the next Core Worlds Couture). More Star Wars goodness from Love and Madness (see this review of mine for details)! And a ton of online birthday wishes from my Star Wars peeps – I appreciate and adore each and every one of you! So, yeah…you could say I had a good birthday! Thank you for letting me share my excitement – and my birthday – with you! What are you most excited about from Celebration London?! Leave your comments below, or you can contact me directly! My favorite social media vice is Twitter, just so you know! Previous article The Caffeinated Collector: Episode 28 - So, You're Saying I Should NOT Start Another Collection?!?! The celebrating continues, and on that note, I wish you a very happy Birthday Month! Oh, don’t worry…Star Wars excitement will not be going anywhere! !